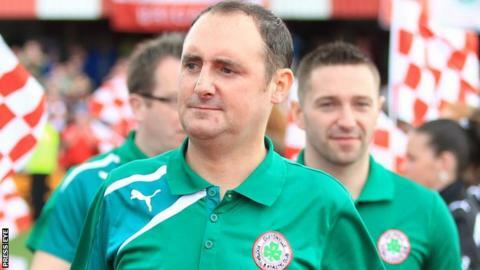 Local football is mourning the death of former Cliftonville goalkeeper Paul Straney at the age of 42. Straney is best known for his five seasons at Solitude, starting in June 2001, and he returned to the club as a goalkeeping coach. He also had spells with Glenavon, Newry City, Glentoran and Telford United. Straney was assistant manager with Amateur League team Kilmore Rec and the club said it is "absolutely devastated" at his passing. He made 179 appearances for Cliftonville and helped them to a League Cup triumph in 2003. "A hugely popular figure during his playing days with the Reds, Paul returned to Solitude as Goalkeeping Coach during Tommy Breslin's tenure as manager," said the north Belfast club. "Straney's penalty shoot-out heroics not only saw off Crusaders in the semi-finals of the League Cup in 2003, but also proved pivotal as the Reds overcame Larne in the decider to lift the trophy for the first time in history. "Cliftonville Football Club extends deepest sympathies to Paul's friends and the entire Straney family circle at this very difficult time. May he rest in peace."